Presenting The Winner's Trilogy #1 The Winner's Curse by Marie Rutkoski. This book. MY GOD THIS BOOK. Utterly and truly perfect. 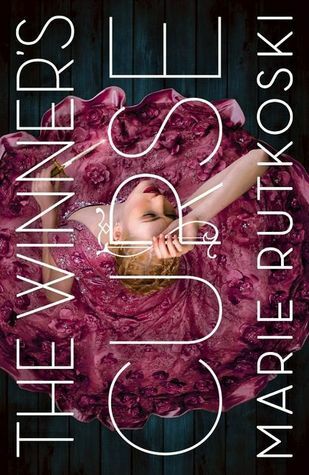 Marie Rutkoski's THE WINNER'S CURSE tells of a richly illuminated world where class matters above all, where the conquered are the slaves and society is a great cesspool of myriad desires and veiled schemes. A vivid milieu of deadly games and hard pressed gambles. Spellbinding and richly portrayed, The Winner's Curse marks an intriguing debut to a masterfully narrated trilogy. Kestral and Arin. Starcrossed lovers. Mistress and slave. Doomed by birth and consequences to be on the opposite sides of the playing field. Kestral, the daughter of the General, excellent strategist. She is clever and has a mind for politics & the military. Afforded every opportunity her class in society offers her but only sees two options available. Get married or join the military as per her father's demands. Constrained by such demands, Kestral puts up a brave front but at heart looks o be free. Maybe that is what she saw in Arin, a kindred spirit, when she bought him from a trader on a whim. Arin was one mysterious guy. And very proud too. He is a slave and a part of the rebellion looking to usurp their masters. Of course he is not bad to look at either. They develop one strange friendship, Kestrel and Arin. While the tension is palpable, it has very little to do with romance at first. Kestrel demands honesty from Arin. She knows he had secrets. Her mind may even confer that she is being played but she starts to depend upon Arin's opinion very much. Doomed for destruction, their characters brought a sense of complexity to the plot never before experienced. A lyrical and well balanced narrative. The winner's curse has it all in spades, aristocratic elements, historical fiction. Two intriguingly complex and flawed protagonist in Kestral and Arin, who add an entirely new level of dynamics to this fascinating narrative/ You can never really guess where their story leads them next. An effective slow burn. This is an exceptionally well built world and the undercurrents of power-play with its twists and turns and shocking reveals leave the readers intrigued by its admirable wordplay. I recommend it, ladies and gents, give this masterpiece a try. "A lyrical dynamo. Intriguingly portrayed and exquisitely enacted. Well played Marie Rutkoski"
This book is still sitting on my TBR shelf. I have got to get to it! And your review only makes it more imperative to get it read! Great review!